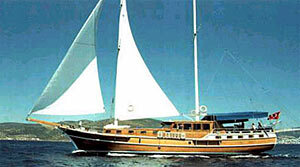 The M/S FERAYE is a superb motor sailor designed for full charter comfort at an excellent price. She has four cabins containing a double and a single bed each, and two cabins with double beds. All cabins have ensuite bathrooms with home style toilets. The cabins have air conditioning which can be run for several hours daily during naps or when preparing to sleep for the night. In the saloon there is everything passengers may need to enjoy and relax, tv, dvd, mp3, cd player, bar and a spacious siitting area. On the fore deck twelve foam rubber matresses make sunbathing a real treat whilst the large sofa of the aft deck offers the shade of the canvas and is ideal for a lazy afternoon nap. Comfort/Recreation: Spacious sun deck area with Sun mattresses and cushions, Sun awning, Cushioned aft deck with a large table, Deck chairs, spacious saloon with bar and dining table, Music Set, Color TV, Fiber Dinghy with outboardengine, Snorkel and Fishing Equipment, 2 Canoes, 1 Windsurfer. The crew of four have their separate quarters. 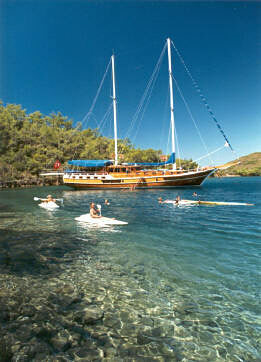 On M/S FERAYE you will be served Turkish cuisine at its best. If there are vegetarians among you, no problem at all, the Turkish cuisine is the best solution for that, you just tell us. Soft Drinks and alcoholic drinks are extra, we offer you to buy them in a supermarket and you just pay us the bill plus a service-extra of only 15% (that's for the crew): We think that's a fair offer and all our previous guests did appreciate that. Embark / Disembark: Upon agreement to agreed harbour, date & time. Preferable Bodrum or Marmaris. In the informations of the most of the gullet charter-companies we miss a clear definition about air-condition on Gullets. When we offer AirCondition, you may think you can switch it on whenever you like. Out of some reasons, it's not! On a boat the AC can only run when the generator is on, or in a harbor when connected to 220 Volt. But mainly you are in anchor bays, often next to a neighbor, who doesn't like the noise of your generator and you wouldn't like it either during the night for example. So most of the gullets have come to a gentlemen's agreement not to disturb each other - AC can be used during hot season on the most of the boats only 2-3 hours in the morning and the same at night from 20 to 24 hours. The M/S FERAYE meets international safety regulations including life jackets, fire extinguishers and alarms. © pixelwork bodrum 1998-20010. All Rights Reserved.